For an up-to-date, carefully-researched and highly-opinionated take on Sydney and Melbourne, Brisbane, Cairns (the Great Barrier Reef), and awesome Outback (Uluru/ Ayers Rock), who could we better have chosen than a life member and past president of the Australian Society of Travel Writers? 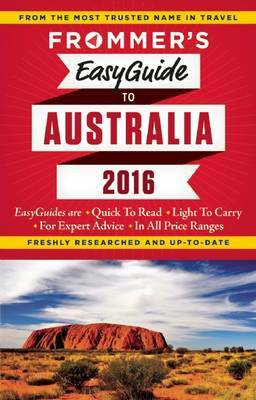 Lee Mylne, a longtime resident of Brisbane, is the author of our 2016 Easy Guide to Australia, and we are honored that, among all her journalistic opportunities, she has chosen Frommer's to publish her travel guides. She has been to every state and territory of Australia, by every means of transport, and has now awarded the reader of her Frommer guidebook with valuable information and unique insights. Her concise, 320-page Easy Guide has everything you need to know.